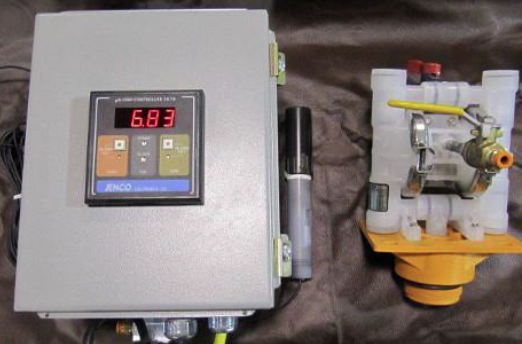 This equipment is intended to automatically adjust pH of an actively flowing stream to a pre-set pH setting. Model PMD-1: If the stream is consistent (regarding pH), the controller will automatically add a single (alkaline or acid) chemical until the pre-set pH is attained. The output from the controller will activate a normally closed air solenoid valve and subsequently will activate an air diaphragm pump, e.g. draw adjustment chemical from a 55-gallon drum and deliver this chemical to the storage/collection vessel. 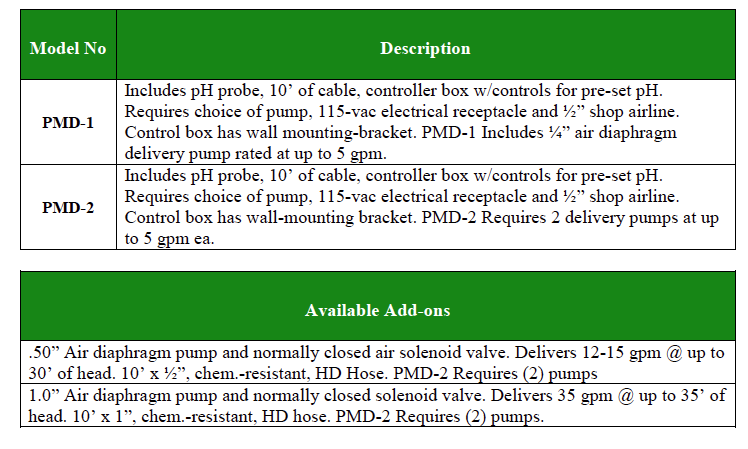 Once the preset pH is reached, the probe will signal the controller and the controller will close the normally closed air solenoid valve. Model PMD-2: If the inflow is inconsistent (pH fluctuates between acid and alkaline), a dual output controller is required, e.g. will add either acid or alkaline to adjust pH to preset level. Same operating principal as PMD-1, except required acid/alkaline will be delivered until pre-set pH is attained. PMD-1 & 2 also feature streaming, LCD read-out of pH in the vessel. We recommend a circulation pump to be added to effluent tank. This will draw effluent from the storage tank and return the effluent, e.g. pump will serve to efficiently ‘stir’ the contents of the tank, thus eliminate “hot spots”. Please discuss w/WE, Inc. technician. The addition of chemical to the collection/storage vessel utilizes a variety of gpm ranges of air diaphragm pump choices. Consult your Wastewater Engineers, Inc. Sales Engineer for proper sizing of required acid/alkaline delivery pump(s).